This is supposed to be cute and clever, and I’m sure some think it is. Some think its true. What most don’t realize is it’s just another logically fallacious and philosophically flawed statement. Here’s 4 logical reasons why, with a biblical reason thrown in as a bonus. This statement is making a number of extraordinary (but incorrect) claims. The most obvious incorrect claim is that we are all atheists because of what we don’t believe. In so doing, it equivocates on the word “atheism”. 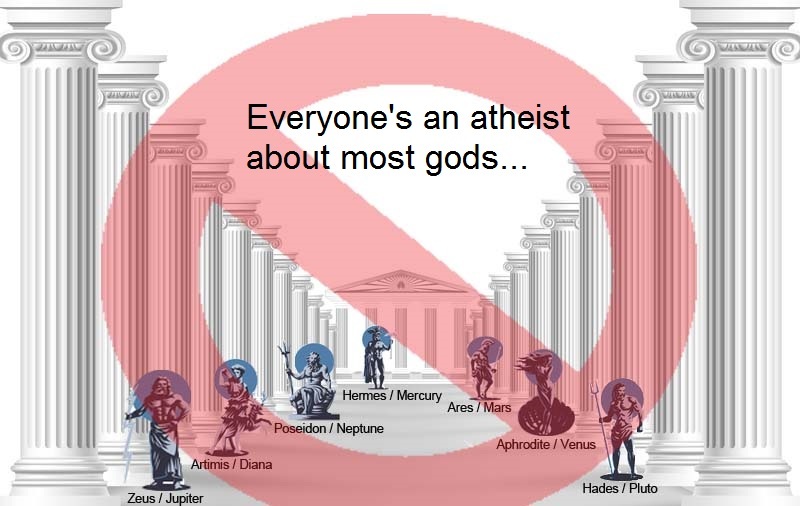 Atheism is not disbelief in some pagan gods. Atheism is disbelief in all Gods. We all know that. 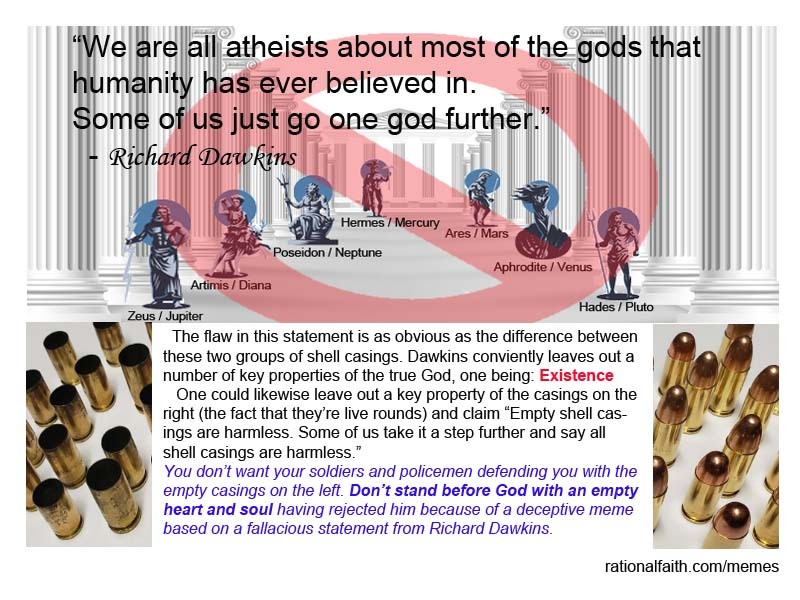 Claiming “we are all atheists” about some gods (while allowing that some believe in a god or the true God) is changing the meaning of the word and thus committing the fallacy. Furthermore, atheism defines a worldview that is quite different from a theistic worldview. So the belief in just the one God that atheists refuse to believe in has a profound effect in how you how you think and view life. To claim a theist is in anyway an atheist is to claim there is no essential difference between the two. If there is no essential difference between the two, why does atheist cheerleader Richard Dawkins write books and support campaigns that try to convince everyone to be an atheist? Clearly the difference of belief in the one God makes all the difference in the world. Similarly, this meme pretends that all types of non-belief are the same. They are not. Just as atheism and theism are not the same, all types of non-belief are not the same. On the other hand I could have a disbelief based on logical, mathematical or evidential grounds. I suspect many would consider that a stronger position. For example I disbelieve that 2 + 2 = 6. And I have much evidence (some would call it proof) to support that non-belief. Thus my non-belief that Dawkins and Hawking know what they’re talking about when it comes to God is qualitatively different from my non-belief that 2 + 2 = 6. Based on this meme, atheists want you to believe that all non-belief is the same, though clearly they are not. They want you to believe that non-belief in the flying spaghetti monster (a fictional deity made up to make a point) is the same as non-belief in Jesus – for whom we have much evidence for. They simply are not the same types of non-belief. In the same manner, not believing in false gods is not the same as not believing in the true God for whom there is much evidence. Logically, the meme makes a faulty comparison. And the mistake is compounded with the error of selective evidence because there is enough evidence to tell them that the God of the Bible is not like the pagan gods they disbelieve in. But they are selective in the evidence they will accept, and thus refuse to consider the evidence that makes clear the distinction. This has the format of a logically valid syllogism. But it fails as a syllogism because it incorporates the above defined logical fallacy. The problem is the premise states what the atheist is trying to prove. That makes it a classic circular argument. Way to go atheists. You’ve just proved what we already know: you presume without proof God does not exist, and you’re very poor at arguing logically. This meme is either ignorant of, is intentionally lying, or is deceived about a fundamental characteristic of God: Existence. Existence is an integral, unremovable part of who God is. It is so fundamental that he reveals himself as “I Am” (Ex 3.14-15). “I am” of course means “I exist” as Neil Diamond so passionately sings. “If it’s possible there’s a being like that, it follows from a certain theory from modal logic, it follows that there actually is such a being. That real existence necessarily extends to all possible worlds. Thus the maximally great being (called “God”) exists in this world. In this case it’s the first type: they do not know the existence of God is true, so they assume that it’s false. In so doing they commit the fallacy of appealing to their ignorance. You might recognize this as the typical argument from atheists and agnostics: “I don’t know for a fact that God exists, so I believe he doesn’t exist.” That is the essence of the argument from ignorance. 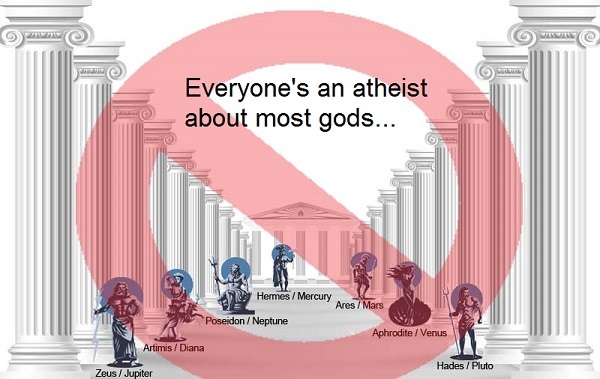 Thus, the success of this meme is based not on a simple addition of another deity to a list of false gods; no the success of this meme is based on the hope that you don’t recognize that the atheist is using a logical fallacy to pull a quick one over on you. But once you recognize that the atheist is arguing from ignorance, and foolishly assuming that the God of the Bible is like the many false gods the atheist also doesn’t believe in, then you realize what a foolish argument this is. Some would say one could use the ontological argument for any of the pagan gods like the Greek, Roman or Norse gods or the flying spaghetti monster for that matter. The problem with that is that none of those gods meet the definition of a maximally great being, which includes moral perfection. The pagan gods exhibit many sins and moral imperfections – as does the flying spaghetti monster. For example in a supposed story about the fsm, the fsm gets drunk and forgets things he’s done. Hardly an example of the moral perfection required of a maximally great being. For those who like sharing memes, I’ve created this meme that deals with the meme’s failure to deal with God’s existence. We think we’re so sophisticated in this modern age that we’re above idolatry, but this statement from Dawkins proves that idolatry is alive and well. Because this statement is nothing but ancient idolatry dressed up in modern language. What does “echad” mean? The word means “one.” So literally the phrase is “the LORD [is (implied)] one.” Is one what? The verse is variously translated “the LORD is one”(NIV) or “the LORD is one LORD“(KJV), which both approach the key idea: The LORD is the one and only God. Thus the simplest translation of the phrase consistent with the context is “the LORD alone” – which by the way, is the way it’s translated and chanted in at least some Messianic Synagogues, and is the meaning affirmed by Christian commentators. Thus in context the verse is saying not only is The LORD Israel’s God, but the LORD alone is that one and only God. Thus scripture affirms the LORD alone is God. He is unique. So grouping the true God in with the false pagan gods because you think they’re all the same, or makes a cute saying is to remove the true God from his rightful place as unique creator and ruler of heaven and earth; and relegates him in with a pantheon of false gods. And anytime you seek to remove God from his rightful place – you’ve created an idol to put in his place. Even if that idol is nothing but your vain, silly and insulting meme. 1. Atheist definition: a person who does not believe in the existence of a god or any god: one who subscribes to or advocates atheism. 2. In his final book, Stephen Hawking states there is “there is no possibility of a creator” because a creator would have to exist before time, which he thought was impossible. Clearly he is ignoring and denying that that very thing is one of the attributes of the God of the Bible – God is eternal – existing outside of time. 3. This is why they claim disbelief in God rather than knowledge that God doesn’t exist, because you cannot know something that is false. And further, they can’t prove God doesn’t exist either. Practically speaking though, their discourse demonstrates that for all practical purposes they behave as if they know there is no God. 8. Messianic Jews believe Jesus (whom they call Yeshua) is the Jewish the messiah, and thus the messiah of the entire world. 9. In the Bible when you see LORD written in Upper case letters – with the “ord” portion made smaller to fit the size of lower case letters, that means God’s actual name, his covenant name יהוה transliterated YHVH or YHWH (the sequence is known as the tetragrammaton) and is used in the actual Hebrew text. Out of respect for the third commandment not to misuse God’s name (Ex 20.7), Jews made it a practice not to say the name and instead said “Adonai” which translates to Lord – which is what we have in our Bibles. from Congregation B’nai Maccabim, Siddur (Prayer book), page 4. This entry was posted in Answering atheists, Apologetics, Atheism, Atheist Memes, Bible, Existence of God - Arguments, Israel, Jesus The Messiah, Meme Mistakes, The Ontological Argument and tagged Alvin Plantiga, Richard Dawkins, Stephen Hawking by Duane Caldwell. Bookmark the permalink.